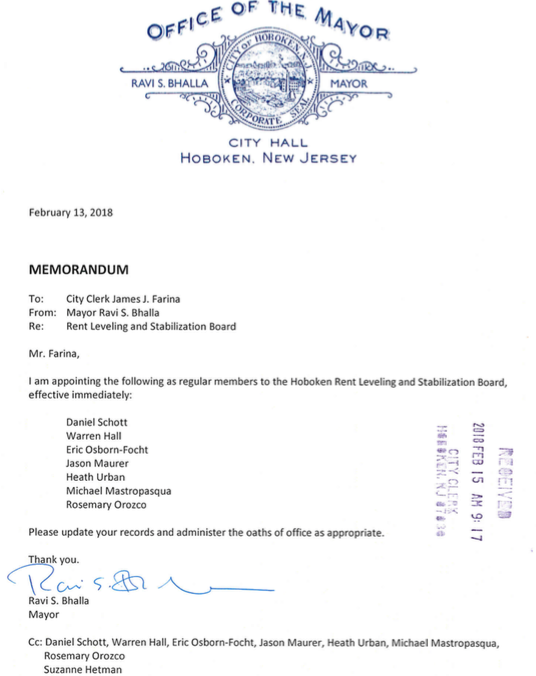 In a letter issued yesterday to the City Clerk's Office, new mayor Ravi Bhalla offered a full list of seven candidates to fill the totality of expired positions on the Hoboken Rent Leveling Board. Notably eliminated from the board are two well known Hoboken government officials: Cheryl Fallick and former councilman Michael Lenz who served as the board's chair. The two board members given the boot share one facet in common: both publicly backed Councilwoman Jen Giattino for mayor in last year's mayoral race. The board removals with announced replacements will see a vote by the full City Council at next week's meeting on Wednesday. Mayor Ravi Bhalla finally made appointments to the hollowed-out Rent Leveling Board. Its 2018 meeting was cancelled lacking any members for a quorum. Now it lacks board members Cheryl Fallick and Michael Lenz. Talking Ed Note: MSV noted Wednesday, the Hoboken Rent Leveling Board awaited action by the mayor's office. Mayor Ravi Bhalla had been traveling on political junkets to Washington DC and Austin, Texas with the entire board unable to hold any meeting in 2018 pending action by the mayor and City Council confirmation. As a result of six weeks into 2018 with no action by Mayor Ravi Bhalla, the previous 2018 Rent Level Board meeting was cancelled. Yesterday the letter seen above shows all seven board positions submitted by the mayor's office for approval. The seven appointments will be confirmed in a vote on Wednesday by the City Council sans Cheryl Fallick and Mike Lenz. Last month, the City Council made its appointment to the North Hudson Sewerage and named its representative to the Hoboken Planning Board. Former councilman Anthony Soares won the overwhelming vote 7-2 and Councilman Mike DeFusco similarly got the nod to the Planning Board. Although both are council appointments, Mayor Ravi Bhalla voiced indignant displeasure to council members about the potential for Soares winning the NHSA vote. Reliable sources said he's incensed about the appointment where a close friend of former mayor Dawn Zimmer and Bhalla's was replaced. The mayor's badmouthing campaign along with his paid political operative at the Cave had no impact on the council's vote for the appointment. The mayor's office was invited to comment on this story. The office and the exiting Zebra in residence remain silent to all inquiries.